← Winners from Brenda Novak and Breast Cancer Posts! Posted on August 28, 2012, in Gwen Hernandez and tagged Gwen Hernandez, scrivener, Scrivener For Dummies, writing. Bookmark the permalink. 36 Comments. Gwen, I’m so thrilled for your success. And I’m just nerdy enough to think it’s the coolest thing to know an author of one of those bumble bee cover ‘dummy’ books. I too get a little thrill when I go in a bookstore and see your book on the shelf. People think I’m weird that I brag, “Hey, I know the person who wrote this!” and hold up your book. But, hey, I can handle the strange looks. And it’s also fun being a bumble bee sister with you (look at the cover of SIMON SAYS DIE and you’ll know what I mean folks!). Again, I’m so happy for you, and for being a best seller no less!!!! Can’t wait to pick up one of your romantic suspense books in the future, the ones with the hot guys on the cover (without the pointy hats). Ha, thanks, bumble bee sister! I’m kind of nerdy about being a For Dummies author myself. That’s my go-to line for learning something new, so being a part of it is a huge honor and surprise. What a fun post! And super congrats to you! Some day you will have the hot guy on the cover instead of pointy chin on the spine. LOL. Detours aren’t a bad thing. They’re there for a reason, and we should take them. If a road is closed and there’s a detour sign, do we just make a U-turn and go home? Not usually. We take the detour! And you might see or experience something that you wouldn’t have normally along the way. Thanks, Kim! I’ve always been a big fan of detours. I guess I like the scenic route. 😉 Thanks for stopping by! I am so Happy for your success that is amazing. I also love how you state how you followed your passion and something unexpected happen! I also am passionate about my writing and I know it will lead to a good outcome! thanks for sharing! Thanks, Syl! We don’t always get what we expect, but sometimes it’s just as good or better. Good luck! Your most welcome Gwen and I agree! Thanks so much! Scrivener is one of the very first programs I bought when I moved to Mac a few years ago. I cannot imagine using anything else anymore. As a long-time (self-taught) user, the first day I had your book, I found tricks and tips I never thought of, or thought could be done. The only time I open Word anymore is to address an envelope or check the Scrivener export to make sure it’s all good. I have two copies of SFD: one hard copy for the library, another on the iPad/Kindle to keep with me when I go to the coffee shop! On a scale of 5 stars, I give this one a 7. Wow, William. Thank you so much for your purchases and your kind words. I’ve never had a 7-star review before! 😉 I’m glad a seasoned user like you was still able to find some new-to-you tricks. I’m the same way with Word. I use it to read attachments, print my grocery list, and check a partial or full MS before sending. I think unexpected success from a detour is all the sweeter! Enjoy every moment. Congratulations on the book, Gwen! 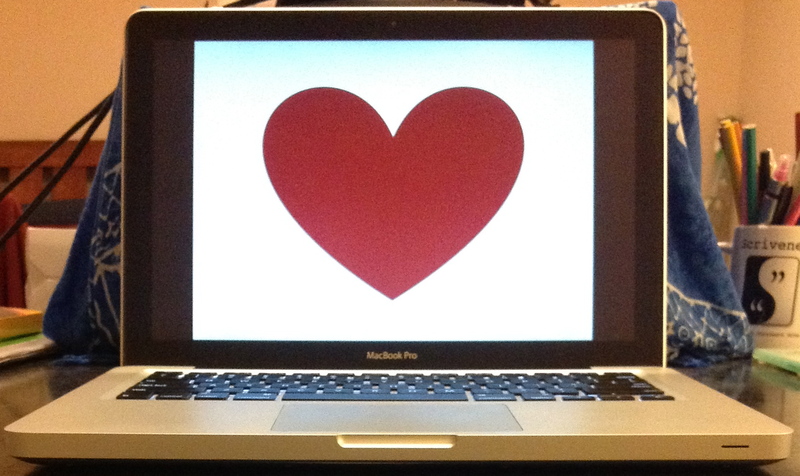 Learning Scrivener (with the help of SFD) is on my fall to-do list. I agree, Krista! The detours are what make life interesting. Thanks! I’m not surprised at all that they asked you to write this book and even less surprised by its success. I’m so happy for you! I think passion shows through, which is why I have a note “It’s supposed to be fun” over my writing area. Congrats on your book, btw. It has an honored place in our household. I love your reminder that ‘it’s supposed to be fun’. Might have to make a similar note for my own workspace. I appreciate you stopping by! Gwen, I’m super thrilled for you – I love this wonderful detour you are on! But I’m also super excited for *me* because I tried Scrivener for the first draft of a ms. once, but knew I wasn’t taking true advantage of what the software had to offer, and instead of taking the time to figure it out, stopped using it. But now I have your book, and this fall I intend to dive in and get the most out of my software. I can’t wait! I remember meeting you online, Gwen, and checking out your website. There was a formidable ‘platform’ of information on Scrivener even back then and I was hugely impressed (and secretly jealous.) Editors and agents LOVE a writer who is diverse and an expert at something! My passion for writing was banked-to-ashes after college by LIFE. Getting a job, getting an apt, quitting a job, moving to a new state, always spending more on cc’s than I could pay…who had time to write? Many years went by with that passion lying dormant in me! In 1999, I went from managing rehab therapies to managing an interior design company (not having a clue about it, but I knew how to manage ppl.) Year after year I watched these designers ‘create’ from a seed in their minds to a spectacular house. Throughout the process their expressions literally ‘glowed’. On installation I’d stare in stunned awe at the beautiful results that came from their passion. Somehow unconsciously, being around them stoked the fire to write-that-novel-I-always-said-I-would. In 2005, (with great trepidation!) I went to the owner, a famous Houston designer by then, and gave up my mgr position and requested part-time status. Not only was she not surprised–she was thrilled! She said she’d been watching me over the years, waiting for my love of writing to trigger again. A year later I switched to writing full-time, but I keep in touch with my designer friends and I’ll never forget how much I owe each of them for ‘showing’ me that a job isn’t just a paycheck. It should be a passion so great and burning within you that you’d even do it for free. What a great story, Sarah! I had always wanted to write too, but never considered it as a “real” career until just a few years ago. I’m so glad you took that big step, and I know great things are coming for you soon! I am so happy for you and your success with your “For Dummies” book. I thought I could keep track of all the details and notes for my manuscripts just by filing them away in folders or online folders until I tried to put together promotional materials for my new book and found myself rereading it several times because I couldn’t find what I was looking for any other way. I am definitely a candidate for Scrivener. I took your RWA PRO class on developing blogs and websites last year and was actually able to create my own website recently based on what I remembered from that class. Your patience with all our crazy, and in my case, frantic questions (because I’d fallen behind) was remarkable. And your explanations of all these “foreign” terms like “widget” and “theme” were concise, clear and understandable. I’m sure that same mindset has gone into this book and can’t wait to get started on it. However, as great as the Scrivener thing is, please keep writing romantic suspense as well. I’ve seen an example of your work and can’t wait to download it for my ereader someday. Thanks so much, Barb. My absolute favorite thing about teaching is when students/readers tell me I made a difference for them somehow. I’m amazed by the response Cyndi D’Alba and I got from teaching that WordPress class. It was well over a year ago, but someone at this year’s PRO retreat whispered her thanks in my ear when I was standing at the door waiting to greet an editor. Gwen, without your expertise, our website wouldn’t look and function nearly as well. Thanks for all you do for us here at Kiss and Thrill. I couldn’t be happier for your BESTSELLING success! Gwen, Please forgive me for being late to the comments, but I want to add my congratulations! I’ve a had lot of careers…er detours… in my life and I have the traffic cones to prove it! Life is the journey and yours is fabulous! What a wonderful accomplishment! What a great example of your talent and versatility! Apparently I have a stack of mail still waiting for me at the post office and it includes a big yellow book that I can’t wait to read! This is only the beginning! No worries, Carey, I appreciate you stopping by. I’ve had a lot of professional detours too, but this one is probably my favorite. 😉 Thanks! I have to admit, Maura, it’s pretty cool. Especially since I was writing about it for free for years. 😉 I’m really looking forward to the day when we both have RS books with awesome covers. We’ll just keep going until it happens. Thanks! Gwen Your passion and dedication in everything you do will get you far, all the best! You deserve it! Gwen’s online class on Scrivener is excellent. 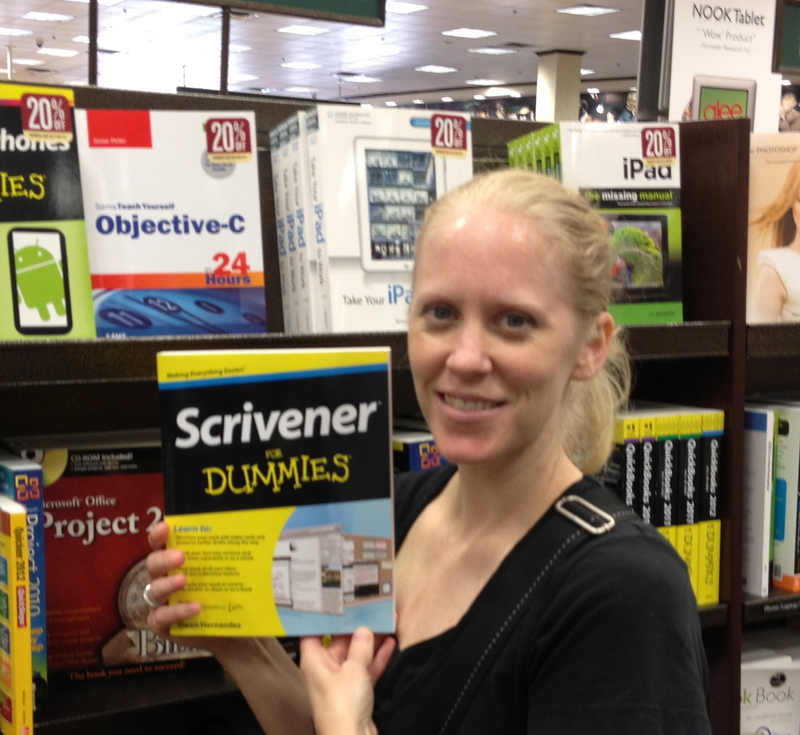 And her Dummies book is indispensable for Scrivener users. I strongly recommend both.